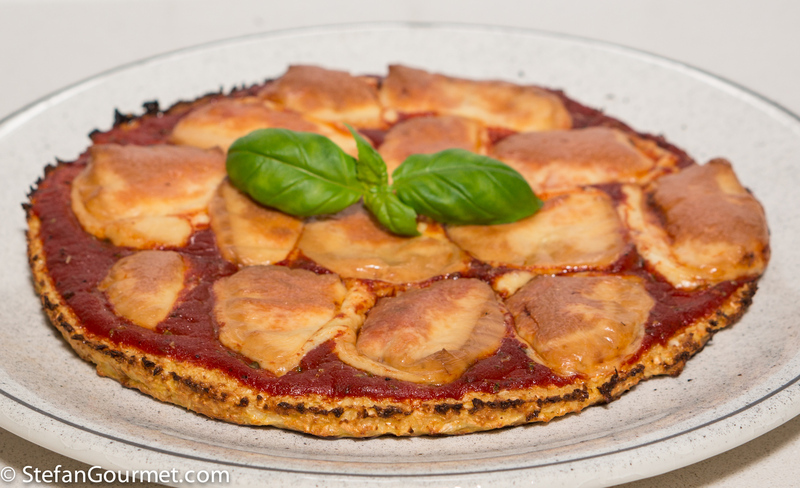 A pizza crust made from cauliflower is often presented as a low-carb substitute for real pizza. I put the word ‘pizza’ between quotes in the title of this post, because I do not think it is a substitute for real pizza. It is very tasty though. 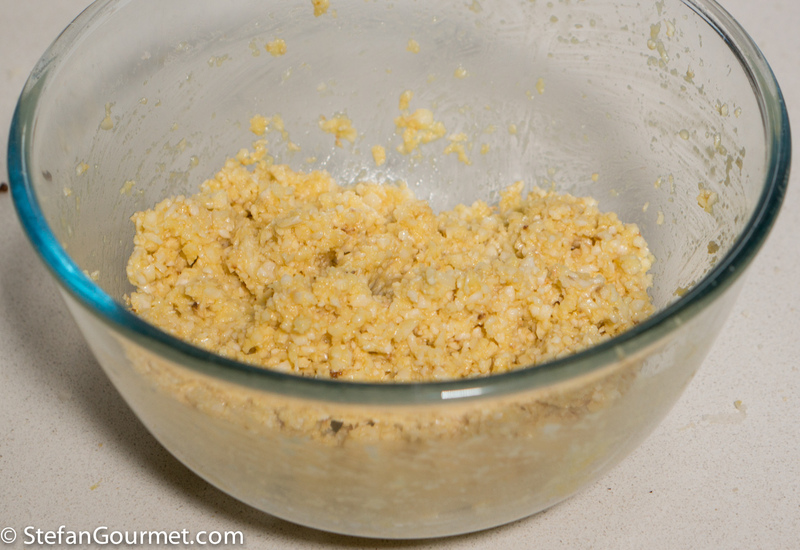 Key to a crust with a good structure without using too many eggs (which would make it too eggy) is to remove some water from the cauliflower. 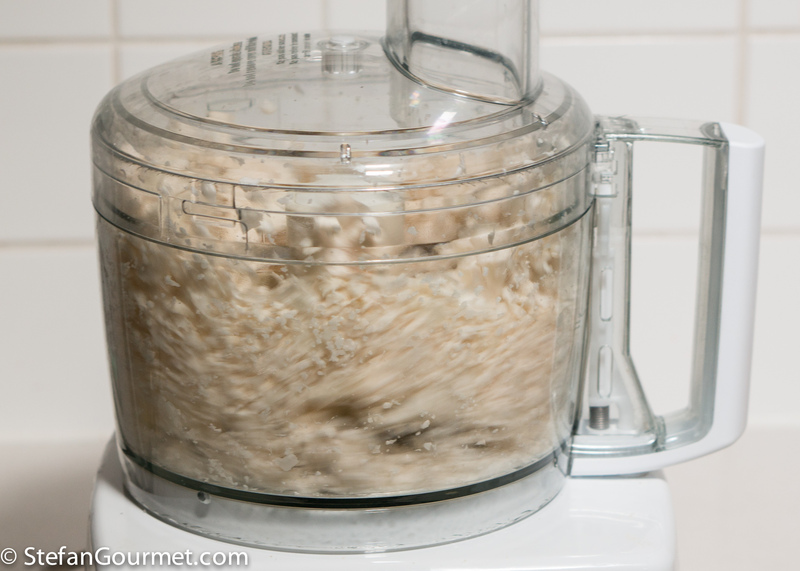 Some recipes will have you cook the cauliflower and then squeeze out some of the water. 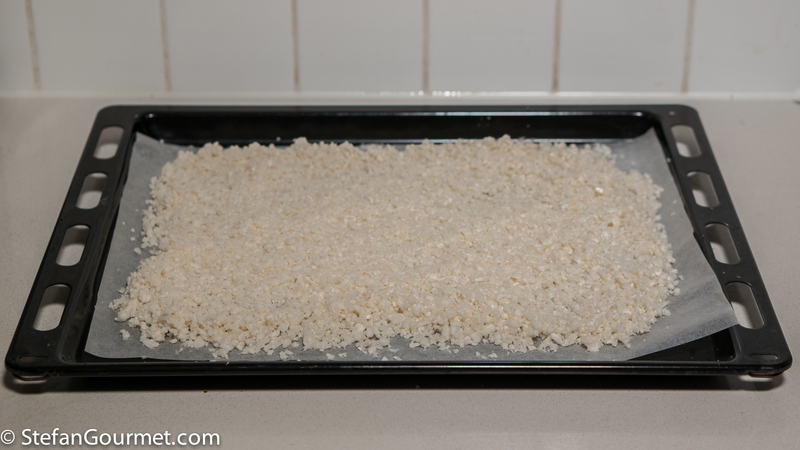 I’ve chosen to roast the ground cauliflower in the oven before using it to make the crust. 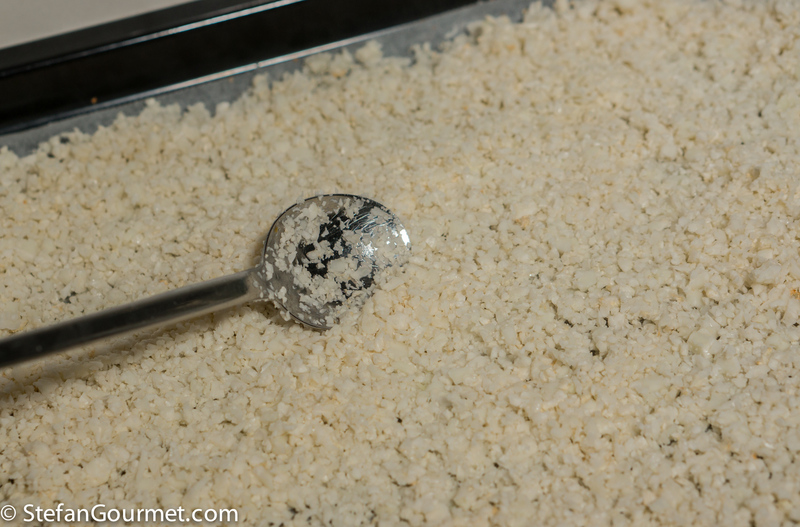 This will enhance the cauliflower flavor (as all of the cauliflower will be browned slightly, not just the cauliflower on the outside of the crust) and remove enough water to make it work. 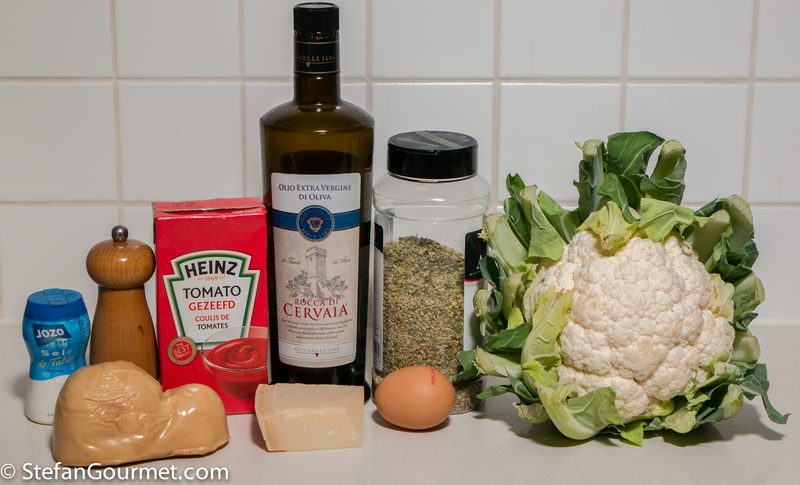 The cauliflower works very well with the tomato puree and smoked mozzarella, known as scamorza in Italy. I sliced the scamorza, but the ‘pizza’ will look better if you shred or grate it instead. If you crave real pizza but you don’t like to eat many carbs, I suggest you make a small but real pizza. If you like the flavor of roasted cauliflower with tomatoes and smoked mozzarella, then this is a great recipe for you. Use only the florets of the cauliflower, not the trunks. 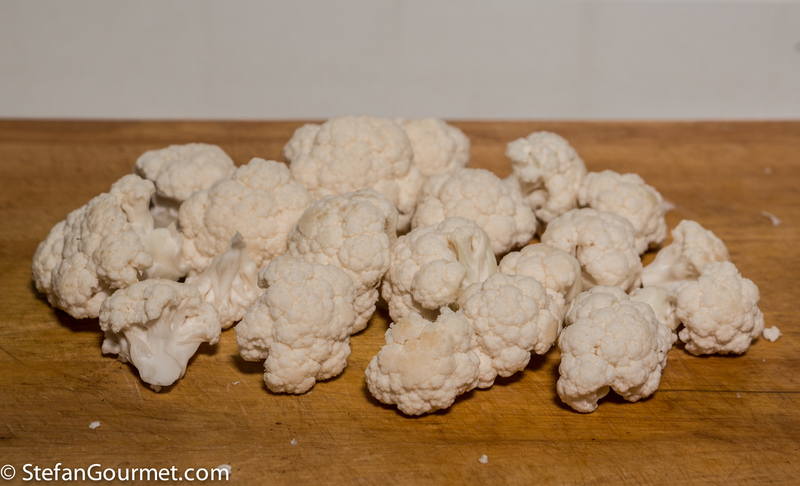 1 medium cauliflower should be enough to get you 400 grams of florets. 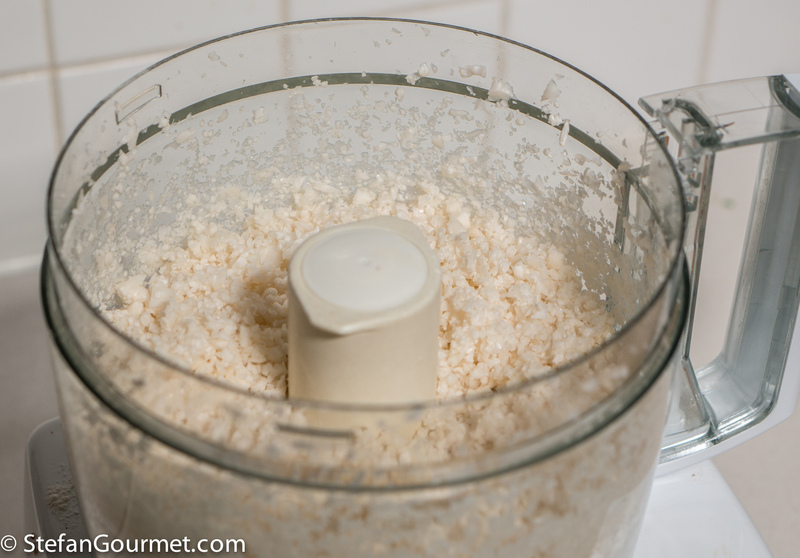 Grate the cauliflower florets, or use a food processor. You should end up with bits of cauliflower that are a bit smaller than rice. 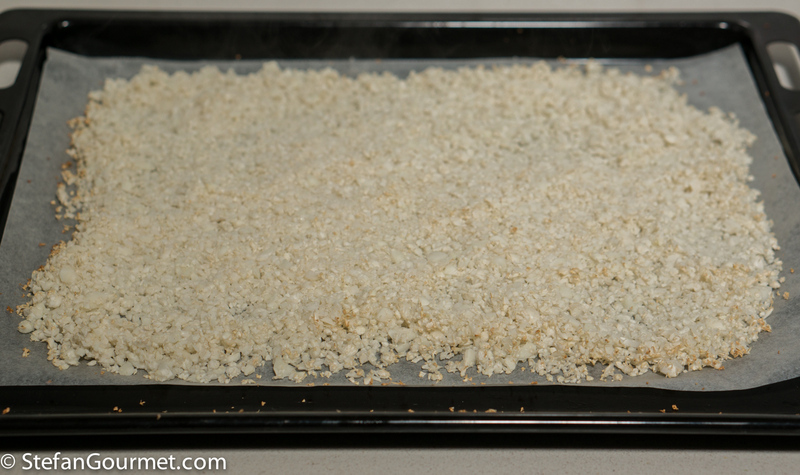 Spread out the cauliflower in a thin layer on a baking sheet lined with oven paper. Roast at 150C/300F (fan forced) for 15 minutes. Stir the cauliflower to ensure even cooking. Roast for another 15 minutes at 150C/300F. Then take out the slightly roasted cauliflower and allow to cool somewhat. Increase the oven temperature to 200C/400F. 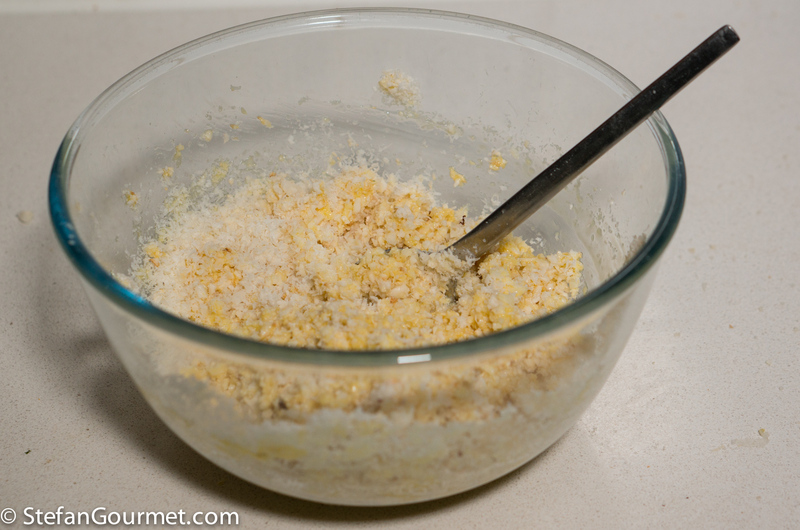 Add the roasted cauliflower to the eggs, together with 50 grams of freshly grated parmigiano. 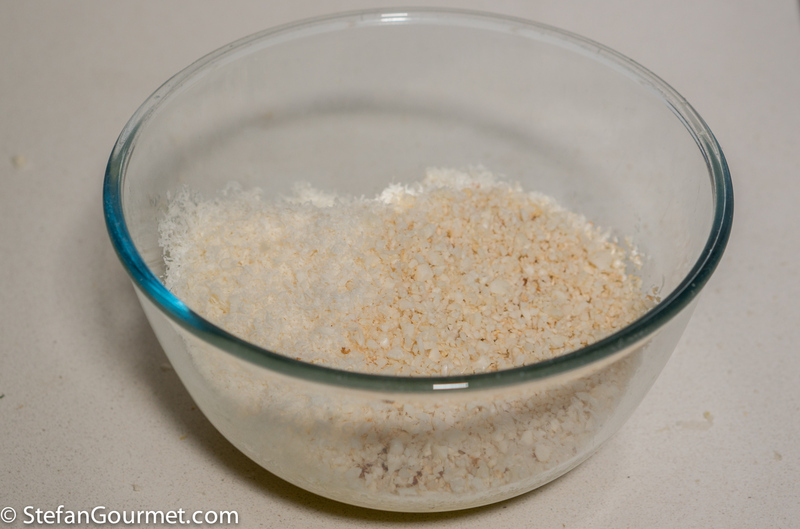 …until the mixture is homogeneous. 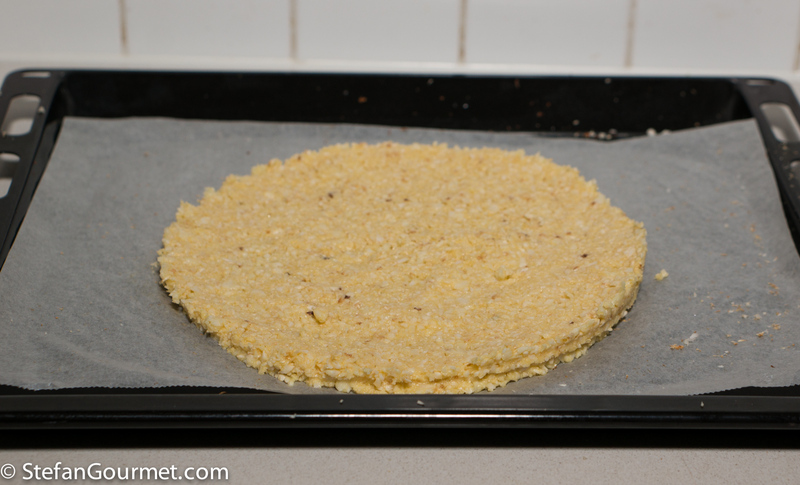 Spread out the mixture in a circle with a diameter of 24 cm (10″) on the baking sheet that is still lined with oven paper. 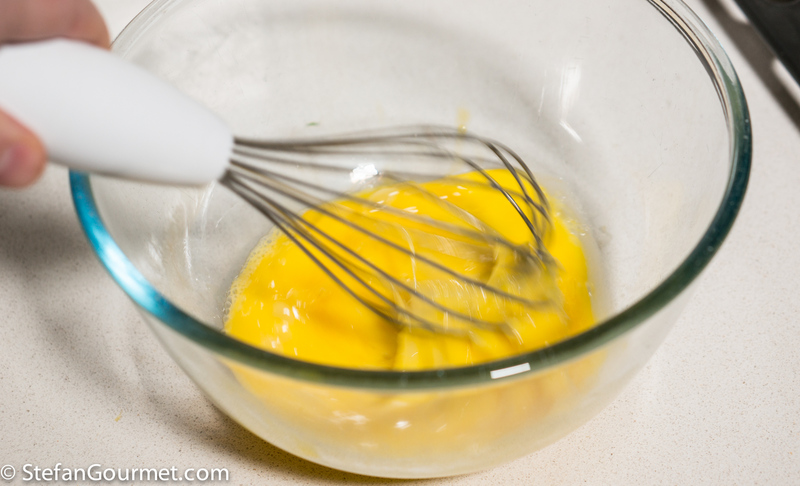 The sides of a springform pan can be helpful to achieve this. Bake for 15 minutes at 200C/400F. 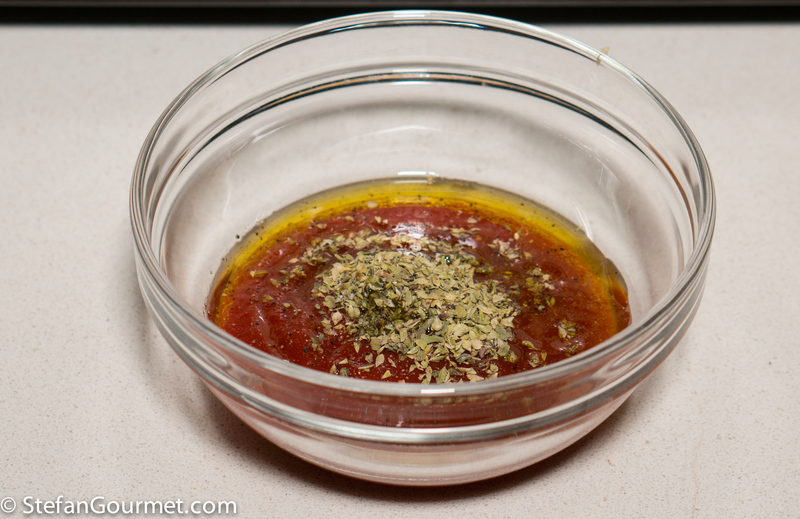 Spread out this mixture on top of the prebaked crust. Top with 125 grams of smoked mozzarella. 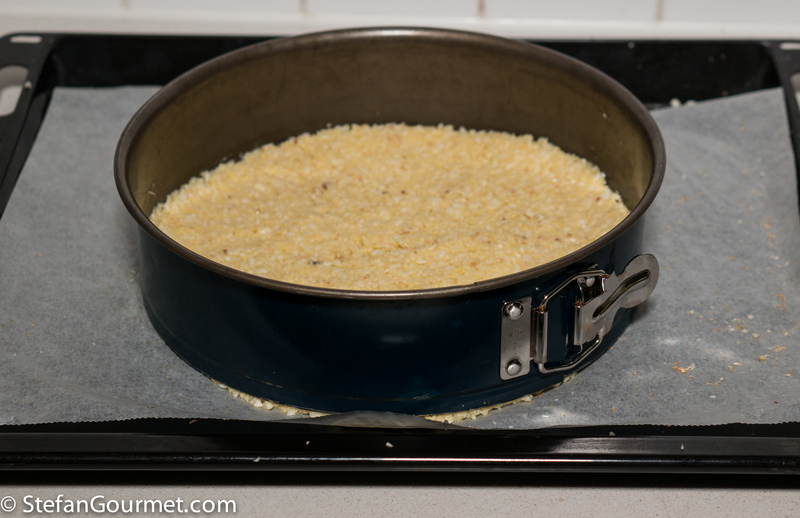 Bake for a final 12 minutes at 200C/400F until the cheese has melted. Your ‘pizza’ is now ready to be enjoyed. I thought this would work well with a medium-bodied Chianti Classico, and it did. 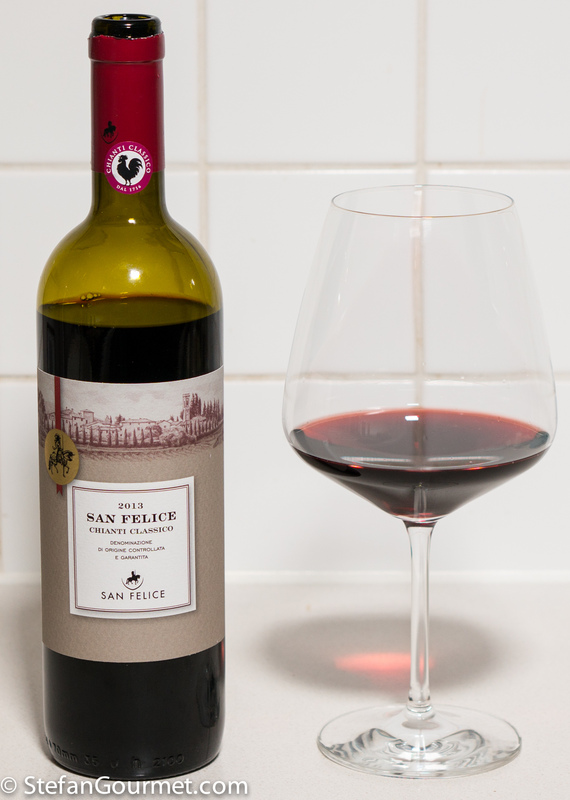 The 2013 San Felice Chianti Classico won tre bicchieri from Gambero Rosso and offers very good value, as it retails in Italy for just under 10 euros. 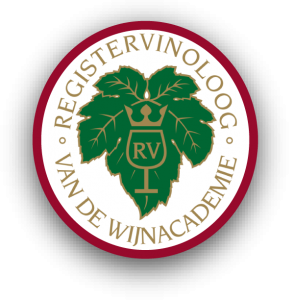 What makes this wine special is that the blend includes pugnitello, a rare Tuscan variety with good quality potential that was rescued by San Felice in the mid 1980s. 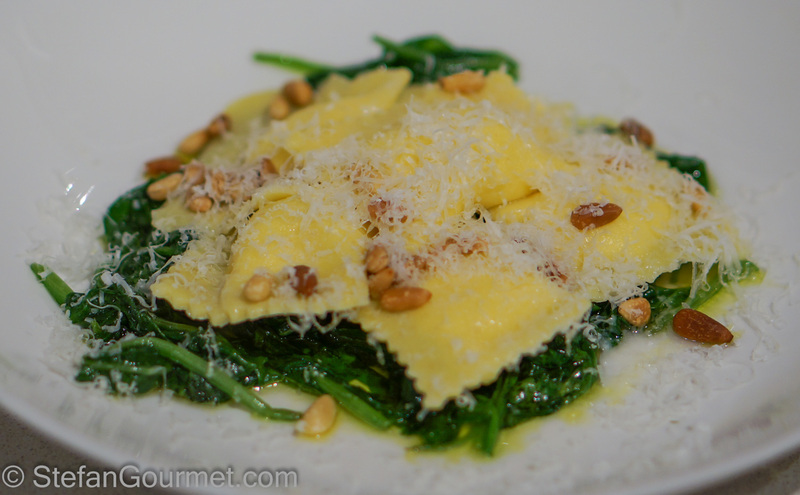 Another dish that works well with Chianti Classico is ravioli filled with ricotta and pecorino, served with sauteed spinach and toasted pine nuts. I think I might stick to real pizza although I am intrigued by the smoked mozzarella. I have never seen or tasted that before. 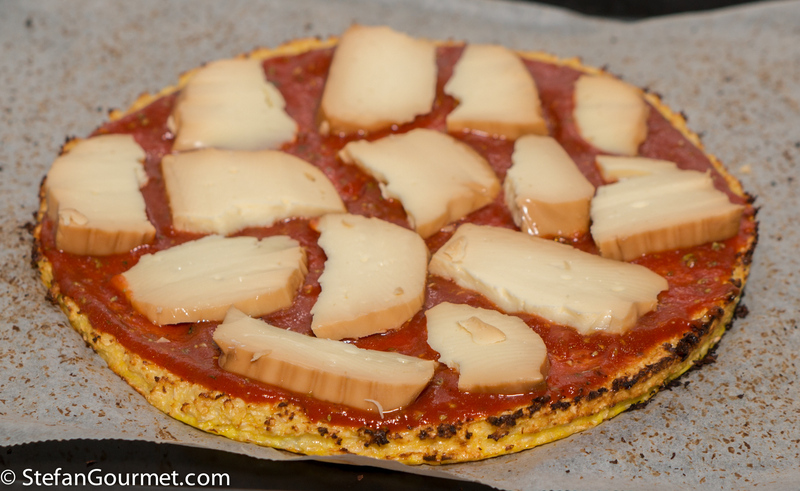 I”ve seen cauliflower pizza before, but never well presented and explained like here! I agree! This is for vegetable lovers. Roasting the cauliflower- less H20 and more flavor, right on. 🙂 Smoky cheeses are something we recently started enjoying. 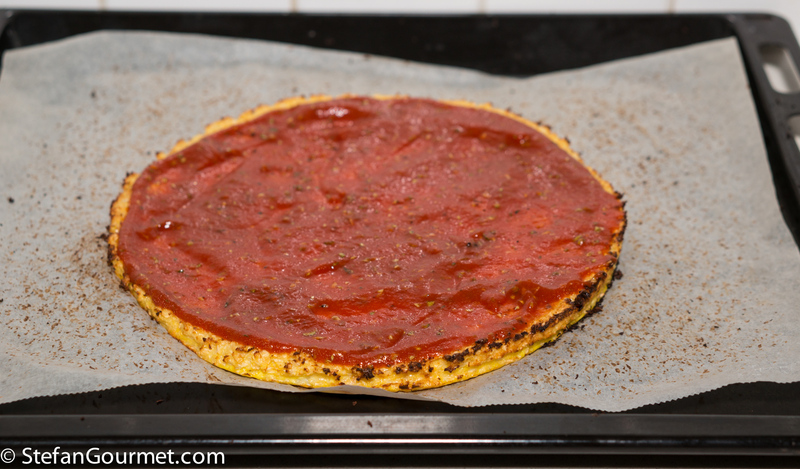 I’ve seen cauliflower crust pizza before, but never the method to dice then roast it before adding the egg, brilliant! 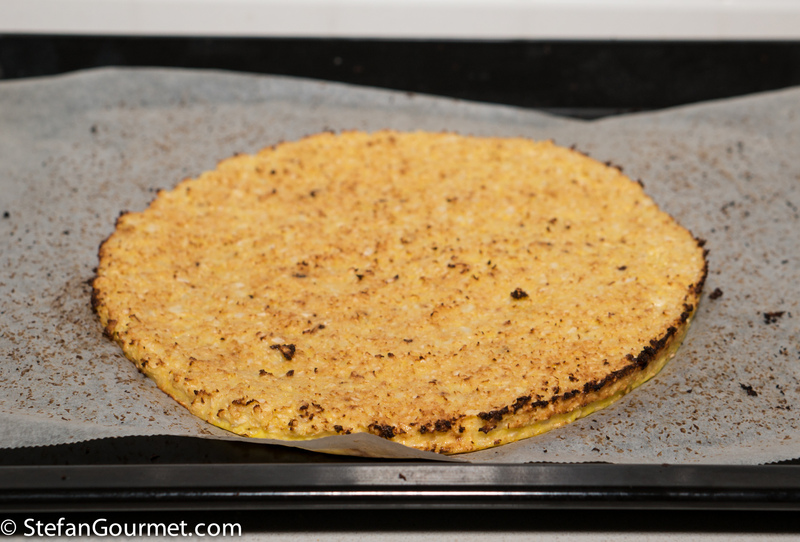 Never seen a cauliflower crust before!! Looks good!! What an unusual pizza Stefan. I don’t think I’d go this route myself but it is very imaginative. Curiosa questa pizza! Immagino che sia buonissima! Chissà se si può fare anche coi finocchi; me ho una cassa piena! Credo che i finocchi hanno più acqua del cavolfiore. Potresti sempre provare, sarebbe senza dubbio buona. Farò un giro di ripasso sul tuo blog. Tu hai usato spesso i finocchi. Questa “pizza” si può scrivere anche senza “” 😉 … Molto originale e senz’altro buona. Thanks for sharing! I tried it this evening. It’s a kind of love-or-hate-thing, I guess. It didn’t work for me. 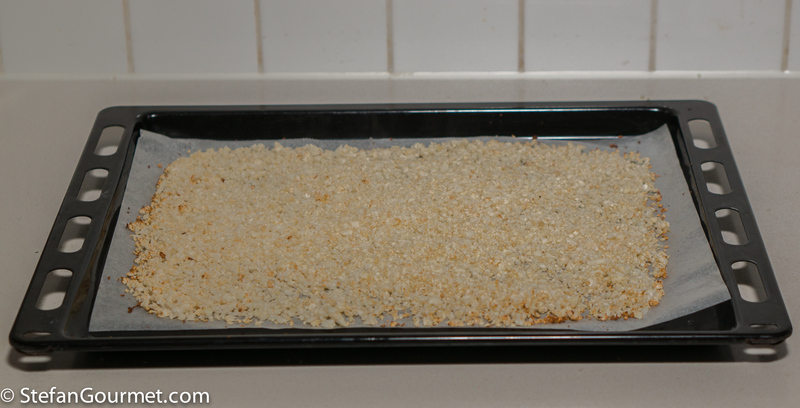 The “crust” is pretty mushy, and the flavors don’t combine very well (for my taste). A pizza dough made from potatoes and flour is – in my humble opinion – a much better choice. The crust is soft, but not mushy and provides a very subtle flavor that combines very well with most toppings. Give it a try. Hi Mike, sorry to hear it didn’t work for you. The crust is not supposed to be mushy though, so something must have gone wrong. Pizza dough made from flour (or enriched with potato) is something entirely different. This is why I wrote ‘pizza’ in quotes in the first plates. If you want real pizza, don’t make it with cauliflower. Hi John, I bet the roasted diced tomatoes will work great on this, too. If you crave pizza, you could have a small real pizza instead of a large fake one. And it helps to go easy on the cheese. Way ahead of you, Stefan. Just made dough for 3 skillet pizzas, one for Friday night and the other two go into the freezer. All this because the grocery I entered today only had 1 cauliflower! ONE!!! I had already been to the fishmonger so I had to get my seafood home or I would have gone to another grocer looking for a better selection of cauliflower. Hi John, this is why I take a beer cooler with some frozen ice packs inside on a trip to the fishmonger. Even in summer it will keep my purchases in good condition until I get home.